Filld is one of the biggest fuel on demand services that was founded by Scott Hempy in 2015. 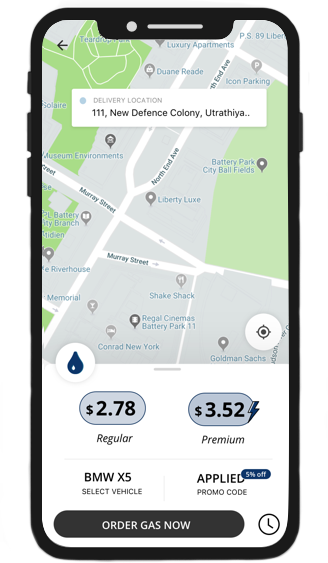 Eliminating the need to look for a gas station, this gas delivery app can make your daily commute hassle-free. Given that fuel delivery was a new thing back in 2015, the founders initially doubted the startup idea of a gas fill up app. But they understood the potential growth of the idea when Filld raised $3.25 million in the seed funding. According to Insight Success, more than 22.4 million users of the on demand apps and services are spending around $57.6 billion annually on its usage. But mobile fueling service falls as a new domain to the on demand world with very high potential in the future. Estimating such high potential in this market, the entrepreneurs are investing their millions of dollars in a fuel management software to generate a good RoI. An app like Filld can save time and efforts for people who don’t like to stand in queues at the gas stations. Moreover, this mobile gas app is known for delivering high-quality fuel by emptying their tanks timely compared to gas stations with old underground containers. So, to make a Filld app clone successful, it is absolutely necessary to build it by adding outstanding features which can help the entrepreneurs to fly high in the sky. Filld strictly works as per Federal, state, and local governments to cover the only risk of this business- safety. It has a team of HAZMAT certified and TSA trained professionals to deliver gas on-time without any danger. It is important for entrepreneurs to ensure safe fuel delivery and work with the law while working on a fuel delivery app clone like Filld. Startups looking to invest in a Filld clone can reap the benefits of this potentially strong market. For seamless location sharing, fuel requesting, real-time tracking, payment integration, delivery scheduling and all other important features of a petrol delivery app, you need state-of-the-art fuel delivery app development. Do you want the best gas delivery app development cost? Get in touch with our top mobile app development company to execute the startup idea of a petrol app with perfection. Customers will have the ease of ordering for instant fuel anywhere with just few taps on the fuel delivery app. No matter where the vehicle is parked, customers can choose delivery time and set the location as per convenience. Free from all worries, customers can track their fuel with the real-time location of tankers. Real-time notifications enable customers to access order status updates, latest offers, and discounts directly through the device notification panel. Customers will get the ease of paying in-app with any method as per their convenience including credit/debit cards, Net Banking, Cryptocurrencies and wallets. Customers can also choose COD for paying at the time of fuel delivery. Referral option will enable users who liked the fuel delivery app to share it with their friends and family members. It will allow users to rate the fuel delivery services offered and leave any kind of feedback they want. After successfully delivering a fuel order, the delivery agents will have the option of updating the order status by taking digital signatures from the customer on this app. Delivery agents can manage their profile details such as their photo, name, contact details, and bank account details with profile management feature. The app will offer the shortest route tracking system to suggest agents a short and collision-free route while delivering the fuel. Managers can easily view and update employee profile info, attendance, employee worksheet, and salaries of the employees working under their fuel delivery business. Enables managers to add or update fuel or gas cost, the distance charges, and cancellation charges. Managers can track exact locations of their fuel tanker or gas loaded vehicles and delivery agents with integrated maps for real-time order and field management tracking. The managers can view and manage customer profiles, their pending payments, shopping behavior, etc. using this app. Managers can send push notifications / SMS to the customers regarding new offers on fuel pricing, discount coupons, etc. to increase customer retention ratio. Enables store managers to know business profits, customer growth rate, monitor complete sales & expenses through in-depth business reports. Managers can see tabular and graphical representation of the data collected by the app everyday to estimate the business flow. Managers can update the inventory by entering new fuel or gas stock with its prices. The stock management feature automatically notifies managers in case fuel or gas reaches shortage limit. The admins or owners can manage and improve the whole working process of an app using a single in-depth dashboard with all the information. Admins can add or modify, new fuel types with certain prices and availability status. A fuel type reaching shortage limit automatically makes the product unavailable for users until the stock is refilled. Admins can access information of all the customers associated with the app to know their buying decisions, buying experience, wishlist demands, favorite fuel type, and many more. This can further be used to launch customized marketing campaigns. Admins can track delivery agents to check their credibility and improve customer experience by on-time fuel delivery. 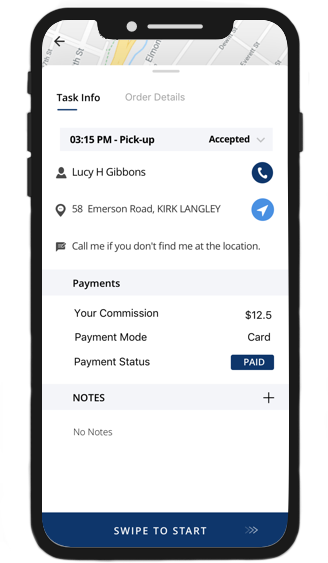 With a number of in-app money accepting services, admins or owners can run multiple-payment processing channels on their fuel delivery app such as credit/debit cards, Cryptocurrencies, Net-Banking and many other country-oriented payment gateways. 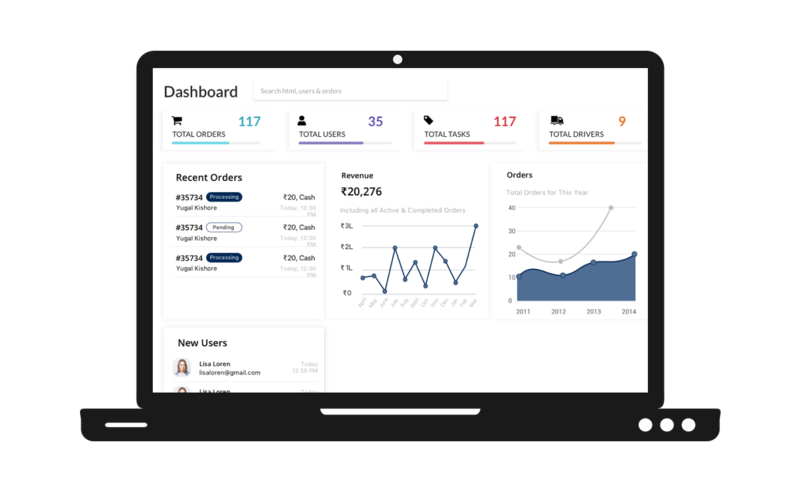 Admins can see complete analytics using real-time dashboard update features with weekly / monthly / quarterly / annually reports of ROI with attractive graphical representation. Ready to start your Online Fuel Delivery Business?